Are you one of those people who have spent hours on end looking for your ancestors? Or are you just close to your family? 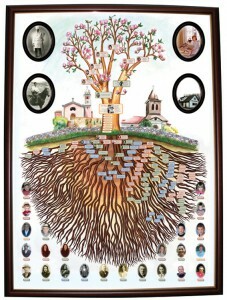 I can help you put together your family information into a beautiful family tree to hang on your wall. 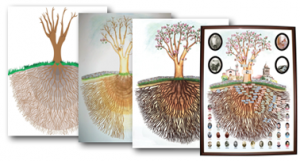 Imagine a gorgeous, hand-painted tree, printed on high quality canvas or artist paper, with illustrations and photographs from your family’s history. The painting will become a lovely complement to your family saga, and is made uniquely for your family. They are normally sized 70×100 cm or larger. The prices for these trees range from SEK 30.000:- and up (printing and shipping not incuded), depending on how many generations, illustrations and photographs you would like to include in your new family heirloom. You pay for your painting in at least five installments: on order, on first proof, when your tree is painted, on final proof and on delivery of your finished painting! Your family tree is printed on high quality canvas and you can order more than one copy of it! Don’t hesitate to contact me if you would like to talk about what your tree can look like, or if your would like a more exact price. By electronic proofs or paper printouts you can follow the whole process of your growing family tree: From a first digital sketch, by way of the hand-painted tree and illustrations, to the printed painting that the whole family can get their own copy of. I work closely to you and listen to your thoughts and ideas, until the painting looks just the way you want it. From your wishes I create the roots and the crown of the tree. If you have ideas of another motive than a tree that is feasible too! Make your hand-painted family tree even more personal! With your own photographs and with illustrations made especially for your family, the painting will become something unique that everybody in your family can feel that they are a part of! Add a photograph or painting of your childhood home, or of the church where you were chistened. Did one of your ancestors have a a really exciting profession that can be illustrated? Add the family farm or grandpa’s grocery shop. Only your immagination sets the limits. You tree can keep growing with your family! Even if you chose a simpler tree today, it can be further developed whenever you like! If you find a new branch of ancestors, or if cousin Lisa gets married and have kids, this can all be added to your painting at a reasonable cost. A hand-painted family tree is a wonderful gift to your loved ones, and it can easily be adjusted to fit the recipient. Maybe you hade the church where your parents got married on the first painting. For your new born grandchild I can change the illustration to better fit the new generation of your family. The whole painting is printed on high-quality canvas and you can order as many prints as you like, for everyone in your family to have a fantastic heirloom to hang on their wall, but to a fraction of the price of the first tree.